Sunny, spacious and private. In the middle of Zurich and yet in the nature. 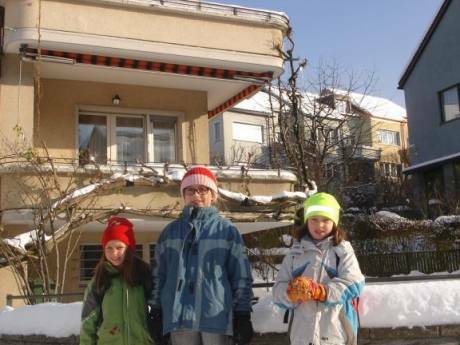 We have a lovely apartment in a quiet residential area in northwest Zurich. The apartment has 3 bedrooms, one of them is used as an office room with laptop and a large dvd collection. It has 1 bath with bathtub and shower cabin and an additional toilet. Thanks to our three year old son we can offer a family all the items needed for a vacation with an infant. 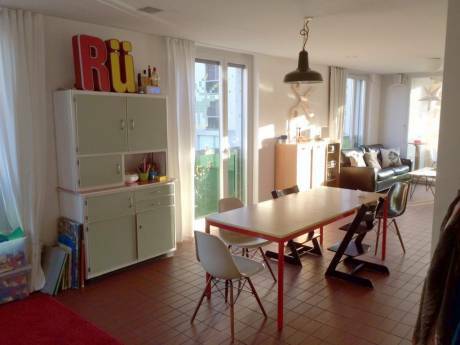 The apartment is on the top floor (3rd floor) with a large and private terrace overlooking Zurich. The apartment is very sunny all day. The rooms are large, light and airy with wood floors. Well equipped original 70ies kitchen with dishwasher, nespresso coffee machine, filter coffee, toaster, blender, wok etc. We have 1 car which would be available for you to use, and we also have several bicycles available. We are a young couple (35 & 40 years) and have a little son Dylan (3). Lukas is a writer, I am currently working in the pr department of a fair trade company. We are experienced travellers and have been to Asia, Africa, South America and United States (Los Angeles, California, Arizona, Florida). We are planning on spending several months from mid October 2011 to February 2012 in Los Angeles and area, the desert and Arizona. We are especially interested in longterm exchanges, but also open to other offers. We are easy going and very responsible. Rest assured that we will treat your home as if it were our own. Thank you for your interest and we look forward to hearing from you! 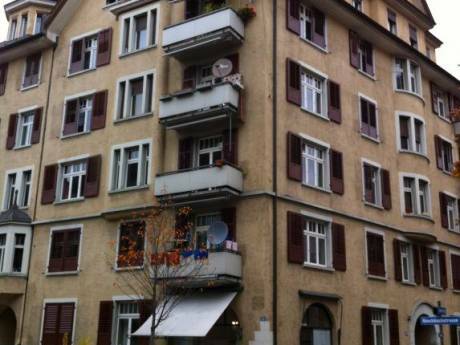 The apartment is on the top floor (3rd floor) with a large and private terrace overlooking Zurich. Throughout the year, when weather conditions are right, you can even enjoy a beautiful view of the Swiss Alps. The apartment is located in a quiet dead end street, yet you find supermarkets in walking distance. The area is called Zurich-Höngg and is on a hill in northwest Zurich. 100 meters up the hill you reach a beautiful forest and large fields with cows, sheeps and an even more breathtaking view over Zurich. Our apartment is quiet, relaxing, great for sunny lounging, yet minutes from the centre of downtown Zurich. It takes 15 minutes by bike or tram to get to the Bahnhofstrasse in the centre of Zurich. Lucerne, Berne and Basel are about 1 hour by car or train. Tram and bus stops to city centre are 150 and 200 meters away. The convenient location close to highway access allows you to get anywhere in Switzerland without having to drive through the congested centre of Zurich.